There are times in a woman’s life when she may face reproductive problems requiring evaluation and surgery from a specialist. Doctors at DaVincii Obstetrics & Gynecology know how frightened and worried you can become. At their Madison Heights, Michigan, office, the team educates women about needed procedures and performs minimally invasive gynecologic surgery in the comfort of their on-site procedure rooms. Call to schedule your appointment today for a consultation. What does minimally invasive gynecologic surgery treat? DaVincii Obstetrics & Gynecology uses minimally invasive gynecologic surgery in treating reproductive problems. It’s used to treat the pelvic pain, ovarian cysts, or uterine fibroids that afflict some women. The team can also perform hysterectomy and tubal ligation procedures with minimally invasive surgery. After consulting with you, the healthcare team at DaVincii Obstetrics & Gynecology may suggest minimally invasive surgery to correct the problem. How is minimally invasive gynecologic surgery performed? Minimally invasive surgery is a type of laparoscopic surgery. Laparoscopic surgery requires very few cuts and often uses the belly button as the entry point. At DaVincii Obstetrics and Gynecology, the staff prefers the use a robotic surgery breakthrough called the da VinciⓇ System. The da Vinci System is a robot-assisted laparoscopic surgery technology that uses small incisions for a shorter recovery time. 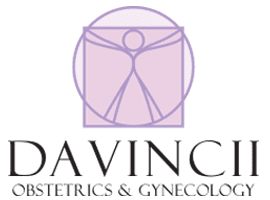 The doctors at DaVincii Obstetrics & Gynecology perform minimally invasive surgery in an exam room or in an outpatient procedure room within the office. The robotic surgery with the da Vinci machine gives the doctors 100% control of the device and also provides enhanced vision with a 3D high definition view of the inside of your body. Minimally invasive surgery requires no long stays at a hospital, so you can leave the office the same day as the procedure. If the medical team decides you need to stay overnight, they transfer you to a hospital. During the procedure, the team applies a local anesthetic; or if the procedure takes longer, they administer general anesthesia. The procedure can cause mild discomfort but is tolerable. After the procedure, they treat any pain with over-the-counter pain medication. The treatment team gives you specific directions about what you can expect during and after your procedure. How long will I need to recover after my minimally invasive gynecologic surgery? Most procedures do not require a long recovery time. Once you are home from your surgery, you are encouraged to move around slowly and often. You may also have increased fatigue. Plenty of rest at night and a healthy diet speed your recovery. After one to two weeks, you’ll need a follow-up appointment. Once the team sees you for a postoperative appointment, you can return to work and normal activities if the team at DaVincii Obstetrics & Gynecology is satisfied with your healing progress. If you are concerned you do not have enough time for a long hospital stay to correct reproductive problems, ask the professionals at DaVincii Obstetrics & Gynecology for their advice about laparoscopic surgery. Call to schedule your appointment today for a consultation.